Here is the second post of our three-part series on branding! Throughout the series, you'll get a deeper look at our philosophy on branding and how we help clients build EPIC brands. Imagine your favorite coffee shop. Can’t be too hard since you were probably just there within the last few hours. But imagine when you first fell in love with that place. It checked off all your boxes, right? Nearby home or work for you, the coffee was delicious, the price was right, and they were open when you wanted to go. Visit after visit, this became a reliable space for you. You knew what to expect from them because they consistently delivered based on those expectations. Consistency is one of the most powerful tools in developing a brand identity. It helps create brand identity in the same way you call a house a home. You are familiar with the essence of it. You can predict little details without even looking at it. It makes your brand and the customer linked. When consistency is a vital part of your branding effort you are the same reliable brand that customers have grown to know. We are all filled with a warm comfort when we interact with a brand that feels familiar. When I go to the movies I generally don’t buy things from the concessions counter. It all costs way too much and generally, I don’t like carrying a bunch of stuff into the theater. Also, I don’t drink a lot of soda. Just a personal life choice. However, when I sit down in my seat and the pre-movie trailers are running and a Coca-Cola ad runs with a theater filled with bubbles and a chorus of movie goers singing happy songs and sipping soda I am captivated to run back to the counter and get a Coke. It’s not necessarily the flavor of soda I desire either, it’s the fact that they’ve made going to the movies a synonymous experience with soda and popcorn. It feels familiar and right. It feels like they remember me when I go to the movies. The power of consistency with the audience lies in those first few moments before they even know what ad they’re looking at. This is why consistent attributes of branding matter. Consistency gives you the unique advantage to tell your customers how to think about your brand. It can be a color, a typeface, or general aesthetic to a mailer. By doing regular audits of your past and current materials and taking note of the things that make you unique, you can see if consistency is part of your company or if it needs some work. Something else is happening here as well. 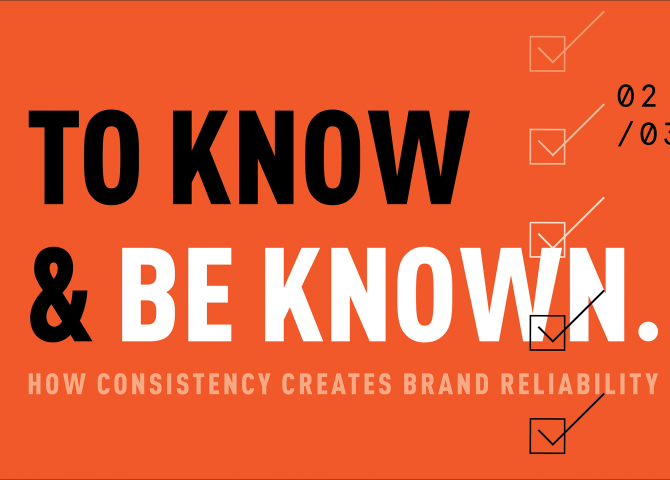 Consumers don’t just feel known when a brand makes consistency a priority, they also feel known by the brand. Back to the case of Coca-Cola ads in a movie theater. The recognizable features of an ad like this have the power to make a consumer feel like the ad was made based on their memories, their history together. It draws them in further because it makes them feel less of a customer of a brand, and more of a friend. Most importantly to all of this, consistency helps you stay on track. The nightmare scenario here is to discover that your business has several different letterheads, departments handing out different business cards, and mailers going out with unfamiliar fonts and shades of your primary color. If something like this has ever happened to you it’s pretty easy to throw your hands up and scream. A few weeks ago I was in a different city for a wedding and I found myself super bored. There was a movie I had been wanting to see so I looked around for show times. To my delight there was an Alamo Drafthouse in this city. The Alamo is one of my favorite companies and it turns out, consistency is a big reason why. At every location they stress what is important to them and the experience they provide. No texting in the theater, comfortable seating, and really good food are among these things. When I walked in to this new Alamo I’d never visited before I knew I’d get a consistent experience. A consistent experience keeps you going back to places. Maybe, you’re sitting there and curious if you provide a consistent experience to your audience. Have a look around your space and take note of anything you use to tell the world who you are. This could be business cards, your website, your sign out in front of your business, the fonts you use, or a million other things. Can’t tell if they’re consistent? They might not be. Fear not, we can help you out. We love to sit with clients and comb through their branding and listen as they identify the key parts of their branding to build around. Consistency is so important to our team that we’ve made brand audits a key step in the design process. The truth is you can’t fake consistency. However, if you take the time and effort to make sure your brand’s message is unified and consistent, you’ll surely see the benefits for a long time.